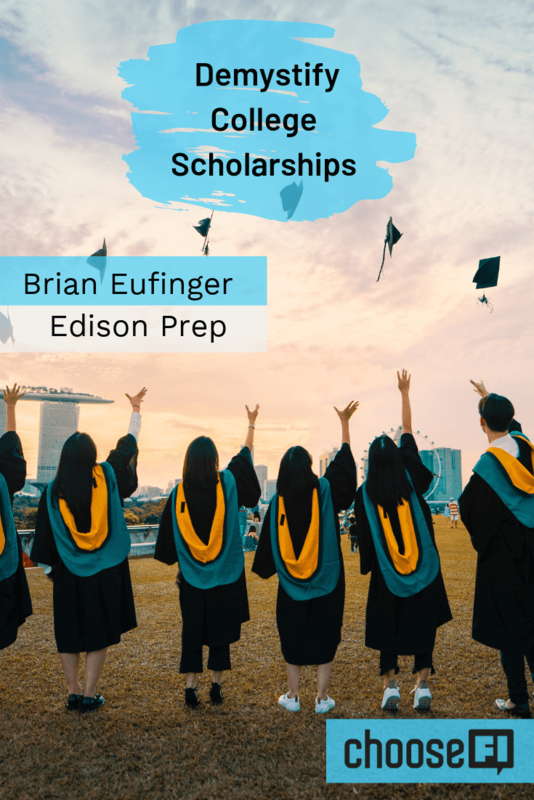 Brian Eufinger, co-founder of Edison Prep, dives deep into the college admissions process. He explains how students should approach grades and test scores to give themselves the best college options. Brian and Silvia Eufinger run a two-person ACT tutoring company in Georgia called Edison Prep. They both do this full time and between the two of them have tutored about 13,000 students, giving them over 40,000 hours of tutoring experience. They still take both SATs and ACTs each year to stay current. Brian has the only back-to-back-to-back perfect scores in the history of the ACT test. Here are Brian and Silvia's full bios. With advancement in college applications, such as the Common Application, that allow you to apply for a multitude of schools with a click of a few buttons applying to colleges is easier than ever. That's good… and not good. It means that colleges are getting exponentially more applications than ever. This makes it harder and harder to get noticed. GPA is the most important part of the application process. As it should be. However, we have to be aware of “grade inflation”. This means that what parents think is a good GPA may not be anymore. In the 90s a 3.5 GPA was pretty good. Today, depending on the school, that may not up to standards with the rest of the student body. 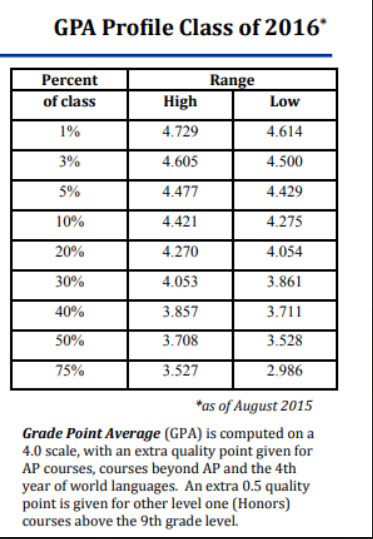 For example, here is a screenshot from Walton High School showing the distribution of GPA for the class of 2016. However, don't freak out too much. College admission officers do have access to how individual schools grade. When a high school sends over transcripts they also send a document showing how your particular transcript falls in line with the other students at that school. This does serve to even out the differences in grading. The important thing is to thrive in the environment you're in. Grade inflation is one reason why SATs and ACTs exist in the first place. With every high school grading differently standardized tests are a great way to level the playing field and compare academic achievement equally across all students. Even with this being the case, some colleges have gone “test optional“. Meaning that they don't require students to take the SATs and ACTs. However, these schools still require these test scores if the student wants to apply for merit-based aid. Here's an article that discusses why some colleges have made this decision. When looking for scholarships you will want to know your GPA, your ACT and SAT scores, and desired major. You'll also want a list of schools you are considering. These factors will all play into what scholarships you qualify for. Your GPA and the difficulty of classes you took will the leading factor in merit-based scholarships. Southwestern Bell – An employee scholarship program he received through his father's job. Other small scholarships including $1,000 from Walmart. Walmart was giving away $1,000 per store and included an interview with the store manager. Brian later found out only eight people had applied at this particular store. Look into what merit-based scholarships are available in your area, and at the schools you would like to attend. Educate yourself early so know what targets you need to hit. For example; Georgia has the Hope Scholarship which provides tuition assistance to students with a 3.0 GPA. They also offer the Zell Miller Scholarship that provides full tuition at a public postsecondary institution and tuition assistance at an eligible private postsecondary institution. Florida has a program called the Bright Future Scholarship which will provide up to 100% of tuition to qualifying schools. Students must earn a 3.0 GPA and a 26 on the ACTs or 1170 on the SATs. They must also do at least 75 hours of service work. 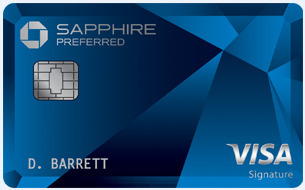 Click here for full eligibility requirements. Colleges often publish established minimums to qualify for scholarships that state the required GPA and test scores required. They will also include income requirements for needs-based scholarships. Brian also suggests applying to more schools than you are considering because you may get offered a scholarship from a school you weren't expecting. For example, was accepted to Cornell, Emery, and Washington University. Cornell offered no aid, Emery offered some, but Washington University offered a full ride. Means-Tested Guaranteed Scholarships and Max Loan Cap programs have emerged recently. Means-Tested Guaranteed Scholarships allow anyone under a set income to receive either a full or partial scholarship as pre-determined by the college. Max Loan Cap programs set a percentage of AGI that the family must contribute to the costs and then a max amount of student loans that the student will be asked to take out. Emory University offers both programs. Harvard gives a full scholarship to students from families earning less than $65,000. Washington University also has needs-based programs for lower income families. Need-Blind Admissions are schools who do not take a student's financial situation into account during the admission's process. They may or may not offer lower-income students financial aid. Here's a list of schools with Need-Blind Admissions. Start early. Be thinking about college as early at 7th or 8th grade. Brian says you'll want to make sure you get on the right math track. That's a joke of course, but it underlines the point of a strong math track in high school. Also, many school districts will include the higher level math classes and intro to foreign languages taken in jr. high on the high school transcripts. This means those classes in jr. high could count towards your high school GPA. This can work for or against you depending on the grades you get. Sophomore year – Get great grades, stay involved in your activities, and take the mock SAT and mock ACT sometime in the Feb to May timeframe. Senior year – Get great grades, don't let senioritis affect your GPA. With GPA being the biggest factor in getting accepted to college and getting scholarships you'll want to protect it at all costs. Brian says the biggest risk factor is taking to many extra circular activities, especially sports since they can be so demanding of your time. Playing too many sports during high school can really take away from a students ability to get the great GPA that colleges are looking for. Quoting the Director of UG admissions, Brian says “When parents or students say that their kid's schedule is too busy with other activities to handle more challenging courses, instead of dropping rigorous courses, maybe an activity could be dropped.” Here's more about that. Of course, this doesn't apply if you are looking at being recruited. If you are being considered for a football scholarship it would be crazy to drop football. Take real published full-length practice tests in the second semester of Sophmore year. You don't need to study for this test, you are just establishing a baseline. You'll want to take both a practice SAT and ACT test so you can find out which test you are stronger on. This will allow you to study to the test you are more likely to do well on. Resource: What Can A Sophmore Parent Do This Year To Ensure A Smooth SAT/ACT Preparation Process? Study and take a lot of practice tests. When studying, focus on grammar rules and math formulas. Treat studying for these tests as a class at school. The scores on these tests are worth as much as several semester grades when applying for colleges. So spend time doing this. Don't take one practice test and think you got it. Study and know that you can improve your scores with study and practice. For example, a score of 23 on the ACT is in the top third of scores. But a 26 is in the top sixth. That's a huge jump with just a small increase in score. Here's how different ACT scores fall in the percentiles. Here's how different SAT scores fall in the percentiles. Here's how the ACT and SAT scores compare to each other. Brian told a story of one of his favorite students who played Basketball and had average ACT scores. Instead of quitting Basketball, he woke up an hour early each morning and worked on practice tests. Because he put in the work, he ended up getting a full scholarship to Vanderbilt. Take the test for real Junior year so you will have the numbers when you apply for colleges and scholarships. Taking the tests Senior year is for emergencies. Click here for study resources from Brian's tutoring company, Edison Prep. One purchase you'll need to make is to buy the proper calculator. 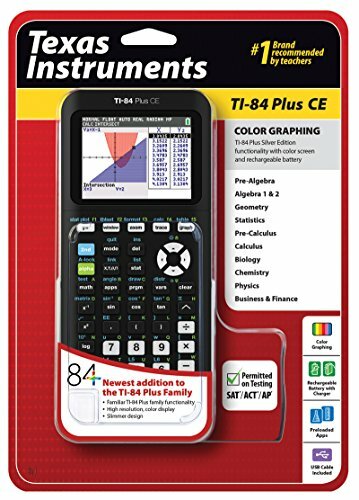 Brian recommends the TI-84 plus CE Full Disclosure: We earn a commission if you click this link and make a purchase, at no additional cost to you. . You can definitely ask around and find a used one, they wear like iron. Also, keep in mind that the test changes every year. You'll want to make sure you are using current study guides. If you are using old books you will not be aware of new types of questions, which will affect your grades. Here's the Official SAT Study Guide Full Disclosure: We earn a commission if you click this link and make a purchase, at no additional cost to you. with 8 full-length tests. Here's the ACT study guide with 5 full-length tests Full Disclosure: We earn a commission if you click this link and make a purchase, at no additional cost to you. .
Getting the test finished on time is often a struggle for kids. There are timers that will help them meet this challenge. Brian suggests that parents be involved and committed to the process. This will help keep the costs of tutoring down as it will allow the tutoring to be more effective. Make sure your kids are doing the studying and practice that their tutor is recommending. He also recommends hiring someone who is a full-time tutor. Someone who earns their full time living from tutoring. 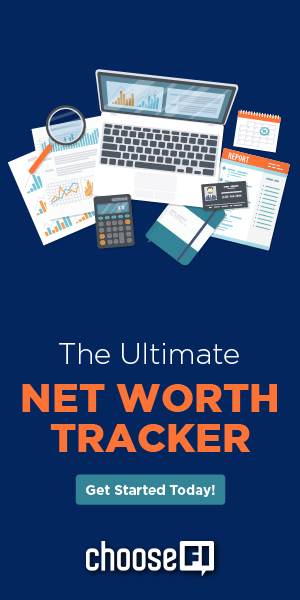 You want to avoid college students who are just looking for side income. They will not be as experienced or committed. Also, avoid big box tutoring companies. You will pay top dollar for lower quality tutors. Questions to ask when looking to hire a tutor. When was the last time you took the test? What grade did you get on the test? Do you do this full-time? Favorite Article: Wait But Why's The Tail End and What Can A Sophmore Parent Do This Year To Ensure A Smooth SAT/ACT Preparation Process? Favorite Life Hack: Text Expander. It's an app that allows you to code strings of characters that will pop up into predetermined text. Brian said it saves him 200 hours a year and only costs $39. This is similar to canned responses but it works anywhere, not just Gmail. Biggest Financial Mistake: Staying in his corporate job too long. The Advice You Would Give Your Younger Self: Do meaningful internships in college and high school. Awesome! Perfect timing for the ages of my children. Thank you so much for providing this wealth of information. I really enjoyed listening to this episode and wished I knew about this years ago. We did learn about the GPA/SAT driving the merit scholarships as we looked into schools. I don’t think people realize how much more money is there along with college acceptance going the merit vs sports route. Not to mention the high cost of sports! My daughter was able to get $22,000 per year for her grades/scores. I found the common data set to provide real information about how the colleges pick students and what scores you need. It’s free and every school provides it. You simply google – “common data set (college name)” The report provides a lot of information. Every college has their own philosophy about how they give out aid. Most IVY league schools tend not to offer merit aid but do have generous needs based aid. So a financially strapped student is better going there while a financially well off student may get more money at a schools that believe in merit aid. The common data set shares how much money the school gives out in each category. The best thing about homeschooling is you can ensure the high GPA and the time to study for the SAT/ACT test. This past year the SAT has so many kids doing so well on the test they actually changed the scoring system to ensure they keep top scores to a small percentage. My son is taking the ACT because of the new curve. We really took the time to find the school that wanted our kid and is willing to give us money. Remember colleges are not looking for well rounded kids, they are looking for pointy kids and will create a well rounded class with lot’s of pointy kids. Really enjoyed this episode; however it is worth mentioning Brian’s advice on when to study intensely for the ACT/SAT should be challenged. If a student is very high achieving, they should study in the summer following their sophomore year in order to maximize their score on the PSAT during the fall of their junior year. PSAT scores in a student’s junior year determines their eligibility for National Merit Scholarships. Both colleges and corporations offer significant aid based on a student’s National Merit standing, and this standing is determined through the PSAT taken during junior year. Ugh I wish I knew about the National Merit for my oldest who is currently a JR. I’ll have to just apply my knowledge to my 14 yo! Hi Julia, Brian Eufinger here! You’re spot on with your advice re: the importance of pre-junior summer for National Merit aspirants. In the ChooseFI Friday Roundup (Episode 114R) that’s coming out on Fri 2/15, we discussed a number of additional topics that there weren’t time to cover in today’s episode, including PSAT/National Merit strategy, how to save money by being a resident advisor and other odds and ends. Great episode, listened to it with my 16 yo daughter. We’ve been through the college selection process twice with her 2 older sisters, and were very fortunate that they were great test takers and National Merit Finalists. It opens up a lot of scholarship options if your student isn’t fixated on the top 50-100 schools. If you have a student with strong academics/great test scores and an open mind about college location, check out https://www.mykidscollegechoice.com – great resources and tips to find merit money. Hands down one of my favorite episodes. So much information provided by Brian on College admissions/Aid – my son is in middle school but this was useful for me to starting thinking/planning ahead. Thank you Jonathan and Brad for doing a wonderful job with these podcasts and bringing on guests with wealth of information.